Quadrologia Pentacònica is an audiovisual work based on a single projection that condenses four originals in 16mm followed by something similar to the echo of a soundtrack; a musical composition played like an extension of the projection, without images beyond the musicians who perform it. The music is a cross of effects from psychedelic voodoo (generated by handmade electronic instruments) with sweet and guttural Portuguese songs, with texts born out of dream-drones and inarticulate skeletons of a snore by fado who finally goes to sleep. Calhau! is the name that conceals the musical and visual projects of the Portuguese duo Marta Ângela and João Alves, together from 2006. Their films, posters, artworks, instruments, performances, texts, concerts and music are a mix of Portuguese voodoo and reboante pulsations of trinkets, held together by a sentiment of sharing and love. 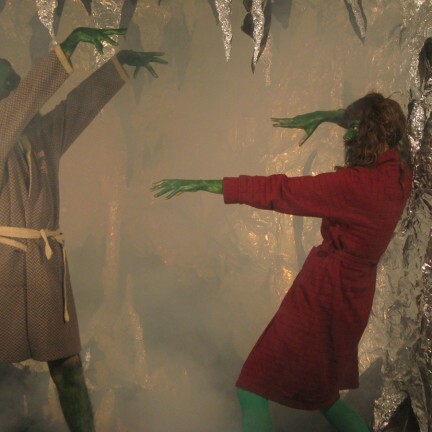 Exultant and, at the same time, terrorizing: grottos in aluminium foil, stalagmites, jokes, mockeries, long beards, impossible dresses recalling Lygia Clark, Joan Jonas and mynt syrup, acompanied by charming sounds, both hypnotic and worrisome.